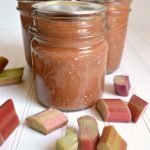 I love our rhubarb plants and the wonderful things we can make with the stalks like orange-rhubarb muffins, rhubarb chutney, lemon rhubarb butter, and even a barbecue sauce made with rhubarb (see even more about rhubarb in our Ultimate Rhubarb Guide). But I have to confess I’m not a huge fan of large chunks of rhubarb cooked into pies or crisps. It’s a texture issue (or stringy issue – whatever you want to call it). So I either dice it up really small, or cook it down because then what’s left is just that great rhubarb flavor. Which is just what you’ll get with this delicious honey rhubarb ginger jam – a perfection of rhubarb and honey with just a touch of ginger. 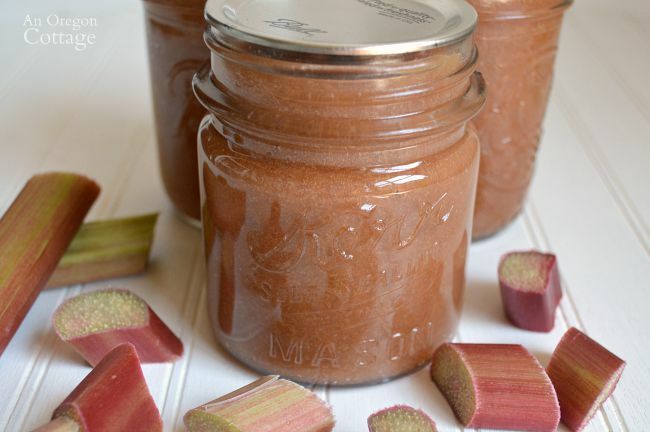 I used to think (like many others, I’m guessing) that because rhubarb was tart a lot of sugar needed to be added to anything you made with it. Like a LOT – many recipes call for more sugar than fruit. But the more I work to decrease the amount of sugar we eat in our homemade foods, the more we find we don’t need all that sugar. And that a tart flavor is a nice, complex flavor that doesn’t need to be completely covered up with heaps of sugar. And this jam is so easy, making just a small batch of 3 half-pint jars, it’s a great way to try out not only cooking rhubarb with less sugar, but also trying your hand at canning, if you haven’t before. 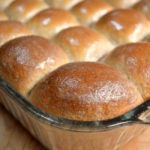 It’s just five ingredients thrown into a saucepan and cooked until thick and syrupy (which is only about 20 minutes), ladled into jars and lowered into a pan of boiling water for 10 minutes. 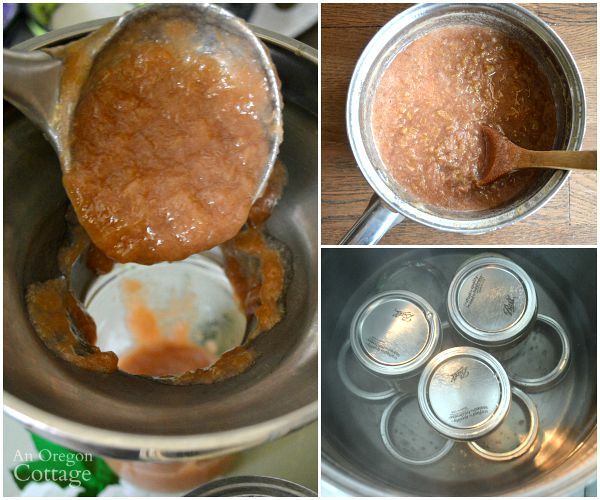 In less than 45 minutes you can have home-canned, honey-sweetened jam! Wondering what to use this jam on? It’s perfection on toast, of course, and also makes a mean PB&J sandwich. Warmed a bit, it’s a refreshing topping for vanilla ice cream and is a great filling for jam bars (just replace the fillings of this or this with the honey rhubarb jam). I’m sure there’s more – what would you use this jam for? Sweetened only with honey, this rhubarb jam has a zing of ginger that makes toast and PB&J amazing. Combine all ingredients in a large saucepan. Bring to a boil over med-high heat, lower heat and simmer until thickened and smooth, stirring often – about 15 minutes. Prepare 3 1/2-pt jars and lids for canning* and start water to boil in a canner (or large stockpot with a rack on the bottom). Skim any foam, if needed (I didn’t need to) and ladle into one, hot jar at a time leaving 1/4-inch headspace, wiping the rims and attaching lids. Process in the boiling water bath for 10 minutes, remove to a towel-lined tray and let cool 12 to 24 hours. 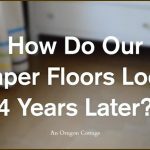 Check seals, label and store. *Alternately, store in the fridge for up to 3 weeks or freeze for longer storage. I was wondering if this recipe would work with frozen rhubarb? I haven’t tried that, Terri. I think if you added all the liquid and fruit, it should be the same. 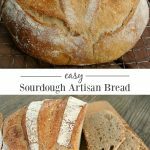 Luckily, it’s a small batch, so easy to try and experiment with! I would love to make this recipe but can you please let me know what the unit of measurement ‘c.’ is? Do you mean a cup? I’m British sorry! Yes, “c.” is for cup. SO glad you tried this and like it Karin! It’s one of my favs, too. Jami this jam sounds wonderful. Have you ever tried using some fresh ginger in it? If Terry happens to come back to read more of the comments, as long as her rhubarb stalks are still juicy she can keep using it. Sometimes they will get quite dry after they flower & then you really can’t use it. Any time you see a flower forming, just break it off to extend your rhubarb season. So you don’t have to add pectin to this recipe? I’ve never made jam without good ‘ol Certo or SureJell. 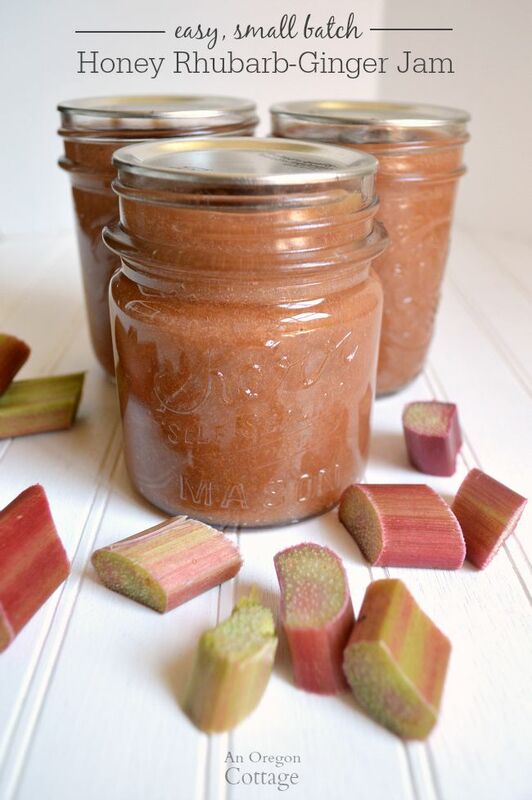 But I’ve never made rhubarb jam either! Nope, it thickens as it cooks, Barb! Hi, it’s August and I have rhubarb plants with thick, stringy stalks and some flowers. Can I still use them to make this jam if I peel the stalks? I’m new to growing rhubarb and thought it was through for the season. I was just going to let it die back come winter and hope for a new harvest next spring. My stalks still looked good, but I’ve never had them flower, so I don’t know if that would affect the taste (though I doubt it). If you have enough, I’d just pull the strings off (I do that usually anyway, ’cause texture issues, ha!) a little more thoroughly and use it anyway! Thank you! Can’t wait to give it a try. One of the nice things about small batch canning is that I can experiment and learn but not waste too much if it doesn’t work out. Totally agree, Terry! That and how quick it comes together make small-batch preserving so do-able.